In 1927, in two papers entitled “On a new foundation [Neue Begründung] of quantum mechanics,” Pascual Jordan presented his version of what came to be known as the Dirac-Jordan statistical transformation theory. Jordan and Paul Dirac arrived at essentially the same theory independently of one another at around the same time. Later in 1927, partly in response to Jordan and Dirac and avoiding the mathematical difficulties facing their approach, John von Neumann developed the modern Hilbert space formalism of quantum mechanics. We focus on Jordan and von Neumann. Central to the formalisms of both are expressions for conditional probabilities of finding some value for one quantity given the value of another. Beyond that Jordan and von Neumann had very different views about the appropriate formulation of problems in quantum mechanics. For Jordan, unable to let go of the analogy to classical mechanics, the solution of such problems required the identification of sets of canonically conjugate variables, i.e., p’s and q’s. For von Neumann, not constrained by the analogy to classical mechanics, it required only the identification of a maximal set of commuting operators with simultaneous eigenstates. He had no need for p’s and q’s. Jordan and von Neumann also stated the characteristic new rules for probabilities in quantum mechanics somewhat differently. Jordan and Dirac were the first to state those rules in full generality. Von Neumann rephrased them and, in a paper published a few months later, sought to derive them from more basic considerations. In this paper we reconstruct the central arguments of these 1927 papers by Jordan and von Neumann and of a paper on Jordan’s approach by Hilbert, von Neumann, and Nordheim. 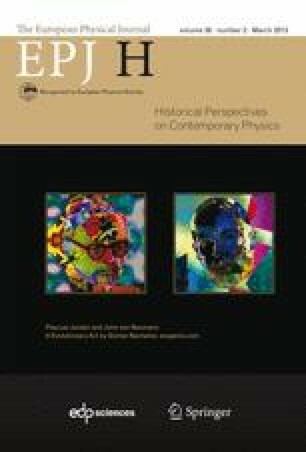 We highlight those elements in these papers that bring out the gradual loosening of the ties between the new quantum formalism and classical mechanics. This paper was written as part of a joint project in the history of quantum physics of the Max Planck Institut für Wissenschaftsgeschichte and the Fritz-Haber-Institut in Berlin.